During the Jurassic Period, birds evolved and insects began to pollinate plants. Many new dinosaurs also appeared, and the first mammals began to evolve. All of these evolutionary developments were decisive for the way our world looks today, with all the mammals, the birds in the air and insects, the animal group with the greatest number of species. Toward the end of the Jurassic Period, birds evolved from small meat-eating dinosaurs. Scientists regard birds as flying dinosaurs. It can thus be said that those ancient reptiles are not extinct, a crow for example is a sort of feathered dinosaur. Dinosaur family tree, with birds at the far left. Birds are the group of vertebrate animals that have evolved most recently. 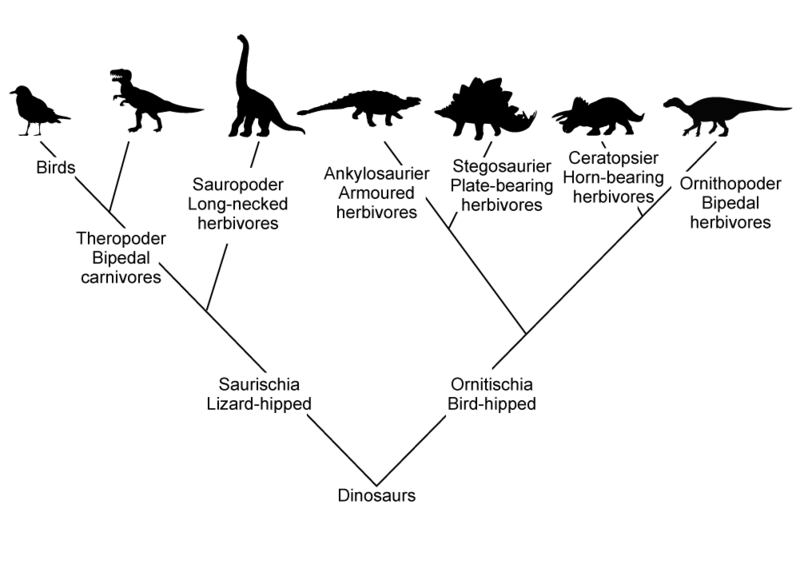 The family tree shows that meat-eating dinosaurs (theropods) were more closely related to birds than to all other dinosaurs. The oldest known birds from the Jurassic Period are combinations of modern birds and predatory dinosaurs. They possessed that feature which makes birds unique even today – they had feathers. Their wings were well developed and they could fly. But instead of beaks they had jaws with sharp teeth, just like the predatory dinosaurs of that period. They also had three small, clawed fingers on each wing, and long feathered tails. 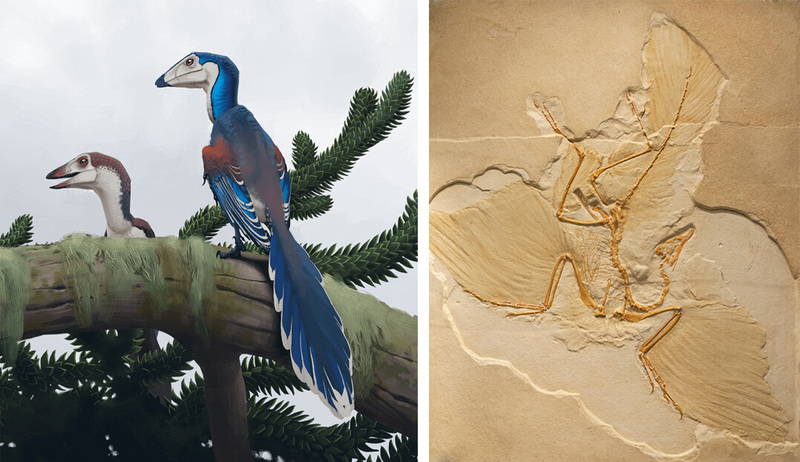 The archetypal species Archaeopteryx was such a bird. Can you find the model of it in this display? the 150-year-old fossil discovered in Germany. The interplay between plants and insects has been evolving ever since insects appeared on Earth. 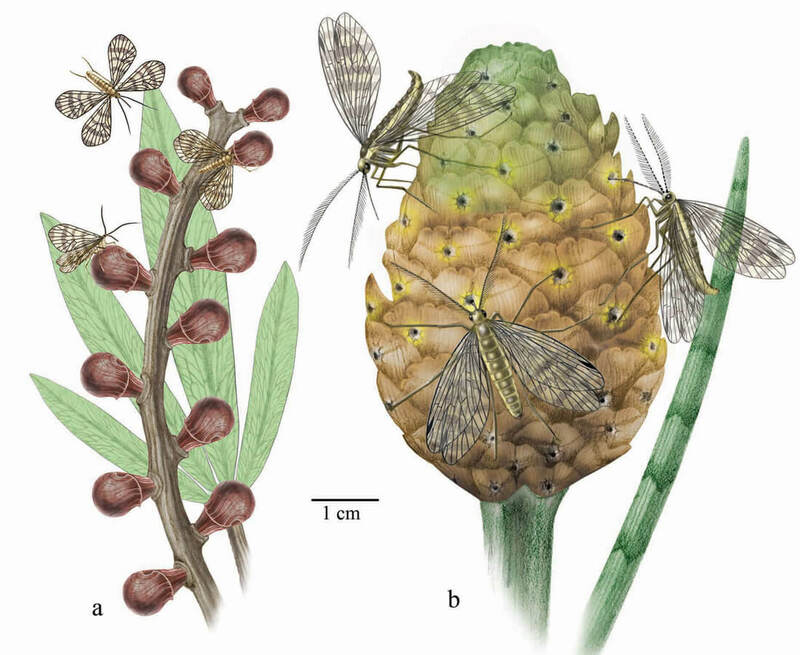 During the Jurassic Period, some insects began to feed on the sweet, nutritious liquids produced by certain cycad plants and a now-extinct group of gymnosperms (plants with exposed seeds). When they consumed the sweet liquids, they also facilitated reproduction of the plants by spreading pollen among them. Thus began insect pollination. Those prehistoric plantsand insects are now extinct.They were supplanted by other insects and by flowering plants during the following geological period, the Cretaceous. The ancestors of mammals had already evolved by the end of the Triassic Period, but it was not until the Jurassic that the first true mammals appeared. We believe that the young suckled their mothers, and we known that they had body hair – two characteristics of modern mammals. They also had teeth that are still typical of mammals, with specialized front, canine and back teeth. The advantage of such teeth is that they enable mammals to seize, hold and chew food effectively. But they did not have baby teeth and permanent teeth like modern mammals. Instead, they shed and replaced their teeth many times throughout life, as reptiles still do. Another difference concerns the hearing system. Humans and other modern mammals have three different bones in the middle ear, but Jurassic mammals had only one, the stirrup (stapes). Mammals’ family tree. Modern mammals are either monotremes, marsupials or placental mammals, all of which belong to the class Mammalia. The Jurassic Period was a time of giants. There were many different species of dinosaur, both meat-eaters and plant-eaters. Two of the largest were Brachiosaurus and Diplodocus, both plant-eaters. There was a wide variety, including small dinosaurs such as Compsognathus. It was a predator that lived on lizards and other small animals. That we know because traces of food in the stomachs of Compsognathus fossils. More about the empire of the dinosaurs? Go back one step and choose Dinosaurs!